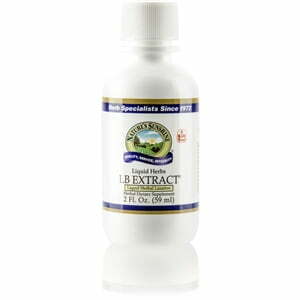 Nature’s Sunshine LB Extract® blends herbs that nourish the intestinal system. One ingredient, cascara sagrada bark, used by Native American tribes, has a laxative effect on the intestines while senna and buckthorn also have laxative properties. LB Extract also contains psyllium, which promotes healthy elimination, and licorice, which encourages proper respiratory and digestive function. Instructions: Adults: Take one teaspoon (5 ml). Children 6-12 years of age: Take one-half teaspoon (2.5 ml). Children 1-6 years of age: Take one-quarter teaspoon (1.25 ml). Mix with a full glass of water or juice daily. A natural and pure extract composed of the finest cascara sagrada bark (Rhamnus purshiana), senna leaves (Cassia senna), buckthorn bark (Rhamnus frangula), alfalfa aerial parts (Medicago sativa), psyllium seed hulls (Plantago ovata), licorice root (Glycyrrhiza glabra), rhubarb root (Rheum officinale), barberry bark (Berberis vulgaris), ginger rhizome (Zingiber officinale), and slippery elm bark (Ulmus fulva)< (with water, alcohol, and glycerin).